International Review of Research in Developmental Disabilities is an ongoing scholarly look at research into the causes, effects, classification systems, and syndromes of developmental disabilities. Contributors come from wide-ranging perspectives, including genetics, psychology, education, and other health and behavioral sciences. 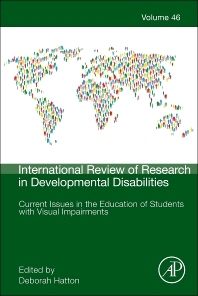 The current volume, number 46, addresses current issues in the education of students with visual impairments. Topics covered include the expanded core curriculum for students with visual impairment; assistive technology; Braille reading comprehension; communication development; orientation and mobility issues, and more. Deborah D. Hatton, Ph.D., is Associate Professor of Special Education and Director of the Program in Visual Disabilities at Peabody College of Vanderbilt University. Her research interests include intervention research in visual impairment and behavioral phenotype research with students with fragile X syndrome. She received her bachelor’s degree in secondary education from Auburn University, her master’s degree in visual disabilities from Florida State University, and her Ph.D. in special education from the University of North Carolina at Chapel Hill. Prior to arriving at Vanderbilt’s Program in Visual Disabilities in August 2009, Dr. Hatton was a senior scientist at the FPG Child Development Institute at the University of North Carolina at Chapel Hill where she spent 15 years directing research and outreach projects funded by the U. S. Department of Education and the National Institutes of Health. Projects included The Early Intervention Training Center for Infants and Toddlers with Visual Impairments, Project Emerge: Understanding Early Literacy in Young Children with Visual Impairments, and The National Professional Development Center on Autism Spectrum Disorders. Prior to her work as a researcher and faculty member in the field of special education, Deborah was employed as a general education teacher, an itinerant teacher of students with visual impairments, and an administrator of programs for typically developing students, as well as programs serving students with visual impairments. She helped establish the statewide early intervention program for young children with visual impairments, ages birth to five years, at the Governor Morehead School (GMS) for the Blind in Raleigh, NC and later served on the board of directors at GMS for 12 years.